Thanks to my fans on Facebook. Cavemen Gourmet just reached over 1,000 fans! I really appreciate all of the support and feedback that CG followers have given to me and I hope to provide more simple paleo recipes for you to enjoy. Wipe your mini pumpkins with a clean wash cloth. Then with a sharp knife, VERY carefully cut the tops of the pumpkin off, about 1/3 of the way from the top so you can get to the seeds. (I find cutting butternut squash and pumpkin to be very dangerous so be careful of your fingers!) Then scoop out pumpkin seeds and fibers. Brush the coconut oil on the pumpkins and sprinkle cinnamon and allspice on top. 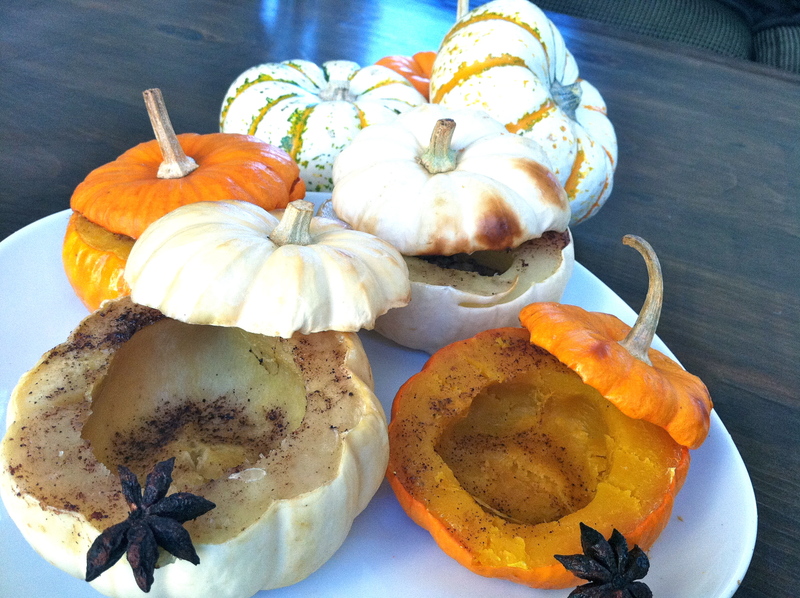 I placed star anise inside two of the pumpkins just for an added kick of flavor. Put the tops back on the pumpkins and place on large baking pan. Bake for 50-60 minutes or until pumpkins are tender. Serve hot or warm! Now that I know how easy it is to make this, I might go crazy with a few pumpkin recipes. I’ll post a separate recipe for the pumpkin seeds – nothing goes to waste here. Just an FYI – I used two orange and two white pumpkins and found both to be flavorful, though the orange pumpkin ended up tasting sweeter. Enjoy!